I will accept partial trade plus cash. 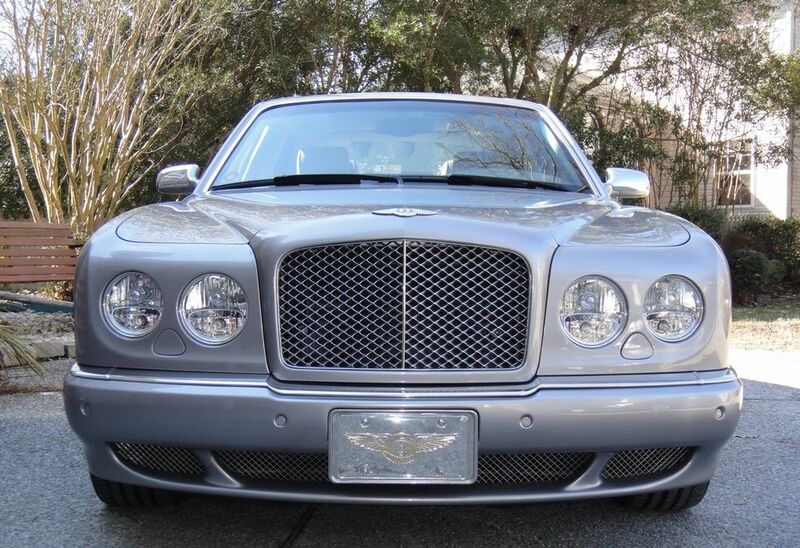 BENTLEY 2005 ARNAGE-R "MULLINER" LEVEL-2. CURENT NADAGUIDES $102000 PLUS $31000 IN OPTIONS!! VERY RARE MULLINER LEVEL-2 !! ULTRA-LUXURY !! SUPER LOW MILES ! SILVER TEMPEST EXTERIOR WITH SUPPLE HAND-STICHED PREMIUM PORTLAND LEATHER - 22K MILES - EVERY ASPECT OF THIS AUTOMOBILE IS DESIGNED FOR A PERFECT DRIVING EXPERIENCE - 6.75L 16-VALVE TWIN-TURBOCHARGED ALL ALUMINUM ENGINE TO ELECTRONICALLY CONTROLLED TWO SETTING SELF-LEVELING SUSPENSION DESIGNED TO MAXIMIZE RIDE COMFORT AND, IN “SPORT MODE”, STILL DELIVERS SPORT CAR HANDLING AND ACCELERATION!! IT IS IN IMPECCABLE AND MINT CONDITION INSIDE AND OUT, NO JOKE!! More than ever, the Bentley Arnage now stands as the symbol of British coachbuilding and handcraftsmanship. With an unrivalled heritage, a skill-set handed down through three generations working on the same site, and an ability to tailor cars to precise customer wishes unapproached by any other marque, the Arnage retains an unique appeal. Every Arnage is built to order and over half are further modified by Bentley"s coachbuilding arm, Mulliner. The Arnage is the culmination of over 80 years continual experience of building Grand Touring Limousines: no other production car in the world can be built more closely to the customer"s precise specification. It is perhaps no surprise then to hear the comment of one regular customer that determining the specification of an Arnage is like having your own, private car company. Another told us he considered his Arnages to have been born, not made. Considering the care that goes into each one, it"s an understandable point of view. The 2005 model year Arnage is instantly recognizable thanks to new front end styling designed not only to tidy and freshen the Arnage"s appearance, but also to bring the range in line with Bentley"s iconic design language, as evident on the Continental R & azure and latterly on the Continental GT. Most notable are the headlamps that comprise twin individual lights with chrome bezels, clear lenses and integrated indicators. These lights now comprise xenon bulbs for dip beam and halogen bulbs for full beam. The Arnage also has a new bonnet, radiator shell and grille, all designed to give a greater sense of occasion and an even more powerful look. The central vee of the bonnet has been raised relative to its lower surfaces and merges seamlessly with the revised radiator shell to give a new and integrated look. The new bonnet line also works particularly well in markets where duo-tone paintwork is popular. A cabin as legendarily cossetting, attractive and elegant as that of the Arnage should not be altered without great thought, and the same principal internal architecture has been retained. Even so, Bentley"s designers felt that both the appearance and efficiency of the fascia could be improved further with no loss of the cabin"s essential charm. Attention was focused in particular on the center console, where a new range of unique switches has been designed for the many functions located there, including the climate control and ventilation systems. These new switches are thoughtfully arranged in an ergonomically efficient and attractive manner that is entirely in keeping with the outstanding ambience of the rest of the cabin. Switches for the electric windows are now more intuitively arranged, while controls for the electric seats, their memories and heater are now located under a sliding panel behind the gear-lever. The ability to conceal these functions as well as the stereo, ash-tray and more minor ventilation controls behind wood panels has allowed the Arnage"s interior designers to create a wonderfully "clean" look to the cabin. Uncluttered by the legion of switches and buttons that are so often a feature of luxury car interiors, the Arnage is able to present its driver just with those controls likely to be in frequent use, while the others are hidden from view unless required. Other new interior features include a new top to the dashboard, allowing the DVD-based satellite navigation system to be flush fitted, creating a cleaner look to the top of the dash. Because it is DVD rather than CD-ROM based, the satellite navigation covers entire continents down to the smallest detail, on a single disc (Europe and US). This means the owner is spared the time and expense of selecting a new disc and re-programming the navigation every time a border is crossed. After the end-to-end re-engineering of the Arnage chassis introduced in 2002, further changes have been made to the 2005 model year Arnage to extend its already formidable chassis capabilities. By repositioning the lower mounting point of the rear damper from the upright to the lower wishbone, a marked improvement in suspension control has been achieved. This, in conjunction with other detailed changes to spring, damper and bush rates (as well as a newly developed Pirelli P-Zero Rosso tyre for the Arnage R and RL) has resulted in much improved ride quality, particularly for those travelling in the back. There is NO bad!! This Bentley is in MINT CONDITION INSIDE AND OUT.